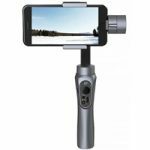 Last month I discussed a new product on the market for smart phones …The Zhiyun Smooth Q is a motor operated gimbal designed to help the camera on your smart phone capture smoother higher quality video. I have been so pleased with the smooth video shots the Smooth Q Gimbal has recorded, I have decided to give one away. That’s right…you read that correctly. Ron Robinson Studios is giving away a new Zhiyun Smooth Q 3. It wasn’t given to us to give away. Nor are we sponsored by Zhiyun. I am just so blown away by this product that I want to pass one forward. In case you’re not familiar with a “gimbal, what it does is keep your camera phone in a stablizied location even when you are walking or moving rapidly.. It works much like a steadi-cam only better…essentially it keeps video from looking shaky…Click here to see an example of the difference using a gimbal can make in your videos. During the month of October, you can register for your chance to win the Zhiyun Smooth Q by commenting on the video below…” I want the Smooth Q”. You must also be a subscriber to the Ron Robinson Studios YouTube Channel. To learn more click here. No purchase necessary. A winner will be announced in a video that will be released on October 31st 2017. In honor of October being the month of Halloween, I give you the most annoying orange engaging with a pumpkin. September was a busy month and I want to thank all our clients for your continued trust in us to produce videos for you. RRS would like to thank Rick Stathakis and Shelby Township for their repeated business. Also be on the look out for new videos we are producing for Doug Wozniak and Stan Grot respectively. Aso in October be on the lookout for a series of videos we are producing for Wrightway Air. As I do every month in this newsletter I invite and encourage you to visit and peruse our new look website. You may be surprised by what you may find. If you would like a video or a video campaign produced for your business or organization, call or Email me today to set up a free consultation. Certified to Fly Unmanned Aircraft by the FAA, Ron Robinson Studios wants to be your “Drone Guy”! 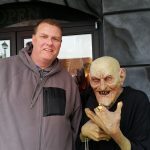 I hope you enjoyed our October newsletter. Please share this email with your friends.